This collection of stories featuring Professor Challenger has a few crossovers. 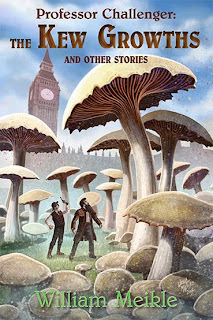 In "The Kew Growths," Challenger and Edward Malone join forces with Thomas Carnacki to combat the menace of giant fungi that threaten to overrun England. Carnacki tells Malone that the fungi originated millennia ago on the high plains of Leng, and that he found a fragment of a chant hidden in The Concordances of the Red Serpent which alluded to manipulation and control of their sporulation process. Thomas Carnacki is from William Hope Hodgson’s short story collection Carnacki the Ghost-Finder. Leng is from H.P. Lovecraft’s Cthulhu Mythos tales. The Concordances of the Red Serpent is from Meikle’s novel of the same name. In "The Petrified Forest," Challenger and Malone encounter winged, five-pointed, barrel-shaped creatures that drain life from other beings and chant "Tekeli-Li!" The creatures are the Elder Things, which appear in a few Mythos tales, notably At the Mountains of Madness. In "Drums in the Deep," Challenger and Malone encounter a group of fish-men who chant the name Dagon. These are the Deep Ones from Lovecraft's "The Shadow over Innsmouth." In "The Cornish Owlman," Challenger, Malone, and Carnacki battle a supernatural owl-like creature in Cornwall. In "The Valley of the Lost," Challenger and Malone explore a plateau in Big Hole Valley, Montana, which is inhabited by creatures from the last Ice Age, an old blind man called the Pastor who came there on a gold-hunting expedition in the 1870s, and a race of hairy wee folk. The plateau, the Pastor, and the wee folk are from Meikle’s novel The Valley. In "Parting the Veil," it is mentioned that Malone learned about the concept of Faraday cages from one of Carnacki's dinner stories. I always tend to think the Poison Belt, the second story Doyle wrote about the character, would be considered an AU. The events seem to big for the world outside your window. Of course, if the Martian Invasion could happen, maybe that did too.